GINsim facilitates the definition of perturbations to define small changes to the regulation of components in regulatory graphs. A perturbation is a set of restrictions on the evolution of the activity level of one or several components. Some tools, notably Simulation and Stable state search, use the perturbation selection panel to apply a perturbation before running. 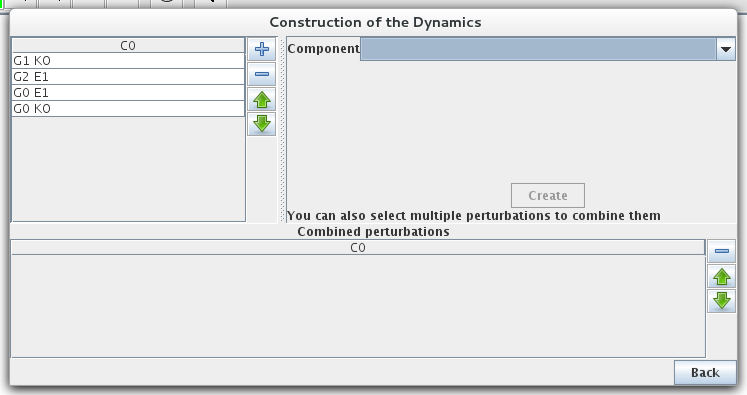 Perturbation can be defined using the following configuration panel. The panel appears upon activation of the configure button in the perturbation selection panel. This edition panel considers two types of perturbations: simple perturbations which only affect the activity of a single component, and multiple perturbations which group together a list of simple perturbations. The perturbation definition panel appears on the top-right part of the dialog above when no simple perturbation is selected, or when clicking the + button. To create a perturbation, one must first select the affected component using the combobox. The restriction configuration panel will then appear, and the perturbation can be added using the create button. The activity level of Boolean components can be fixed at 0 or at 1, corresponding to the definition of a knockdown or ectopic activity respectively. Radio buttons allows to choose between these two possibilities. Multi-valued components offer more possibilities, that can be configured using a range slider. Their activity level will be restricted in the selected range, or completely fixed if the range corresponds to a single value. This enables the definition of simple perturbations where the activity level of a component is restricted to the selected value(s). The definition of more subtle perturbations (conditional knockouts...) still requires the modifications of the logical parameters. We plan to add convenient means to define other types of perturbations in the future. Simple perturbations can not be duplicated: when trying to add a simple perturbation that is already defined, nothing will happen. The bottom part of the panel lists multiple perturbations. Multiple perturbations can be created by selecting several simple perturbation and clicking the button which appears in the information panel. These perturbations can then be ordered and deleted using the buttons on the right side. Deleting a simple perturbation will also remove all the multiple perturbations using it.